The author uses this Calvin quote under the heading, "The Catholic Church vs. the Bible?" He concludes Calvin here is saying Rome's doctrine is unscriptural because... Calvin says it is. The author contends "It is simply not the case that Catholics ignore Scripture in setting forth their theological views" (p.17). Ungodly and evil bishops can just as much conspire against Christ as good and honest ones can come together in his name. We have clear proof of this fact in a great many decrees that have come forth from such councils. But this will appear later. It will benefit our adversaries but little to mention councils of bishops a thousand times over; nor will they persuade us to believe what they contend—that councils are governed by the Holy Spirit — before they convince us that these have been gathered in Christ’s name. This is a great example of how the author reads a text. He argues about a point Calvin isn't even making at the moment. If the author really wanted to respond to Calvin, he should at least respond to the argument being made. Why not argue against Calvin about who decides if a Council is meeting in Christ's name? Why not argue who determines if someone is adding or subtracting to God's word? What criteria serves as a guideline to determine an addition or subtraction? If I were a Roman Catholic reading this section of the Institutes, that's what I would ask. Labels: Biblical Catholic Answers for John Calvin? The Catholic Champion has presented James Swan: Begging the Question on Sola Scriptura. A few weeks back he put forth Revolutionizing Catholic Apologetics: Cutting Out The Middle Man and also wrote this. So, shouldn't I simply skip the middle man? Exactly why should I read Matthew's response according to Matthew's own logic? He should just simply point me to which books would be the best response. But wait... that's the middle man pointing me to the best books. I guess I'm stuck with the middle man is some regard until the magisterium does something, anything.... but their hands are full with lawsuits and allegations this week, so perhaps next week they can work on a good list of resources in response to my comments on sola scriptura. Since Matthew recommends skipping the middle man, the argumentation I'd use in response to him would be found here. I suggest Matthew purchase this book and get right to the source of my argumentation. "The best place to start your research is by using faithful, well educated scholars and clergy to compile your material from, as well as the original sources of the Church, Church Fathers and the Saints." I'm willing to sacrifice the insights of these guys. Whom else could we do without? On a recent post I mentioned Mitch Pacwa's upcoming Reformation video series. Pacwa was recently on Catholic Answers to discuss the project. He's looking to do a ten part series on the Reformation from a Roman Catholic perspective. I mentioned Pacwa says Luther "apparently had killed somebody in a duel" (here is the audio clip). A German biographer named Hans-Joachim Neumann published a book in 1995 entitled Luthers Leiden (English title Luther's Suffering) in which he puts together some circumstantial evidence that in 1505 Luther killed a friend of his in a duel, the friend's name being Hieronimus Buntz, and that the reason Luther entered the monastery was to escape punishment. Evidence suggesting that Luther killed his friend in the dispute Hieronimus Buntz. 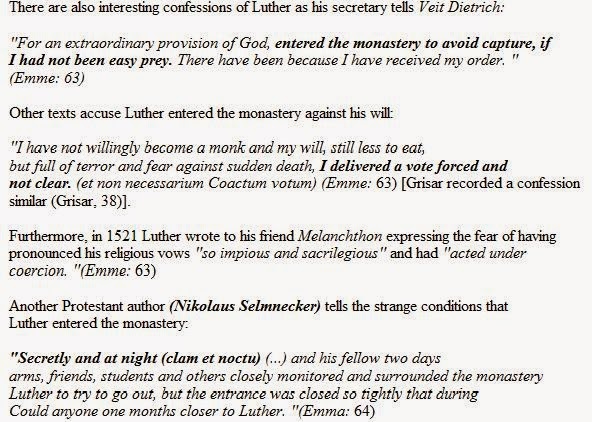 1529 Luther wrote about his time monk: "A man slayer I was" and the biographer of Veit Dietrich, 1532, the Table Talk Luther noted: "After the extraordinary decree of God, I was made a monk, so they do not take me prisoner. Otherwise I would be very easy been caught. As it was, they could not, because it took me to the whole Order. " There have been two duels, where Luther attended during his undergraduate studies. The first duel was under Dietrich Emmes inquiries between Luther and Conrad Wigant April 16, 1503 near Stotternheim. The second duel was fought between Luther and Hieronimus Buntz in January 1505 and died in that regard Buntz. Where it happened is still an open question. As to Hans-Joachim Neumann's book, he's a professor and maxillofacial surgeon at the teaching hospital of the Humboldt University in Berlin. His book attempts to use current medical knowledge on Luther. 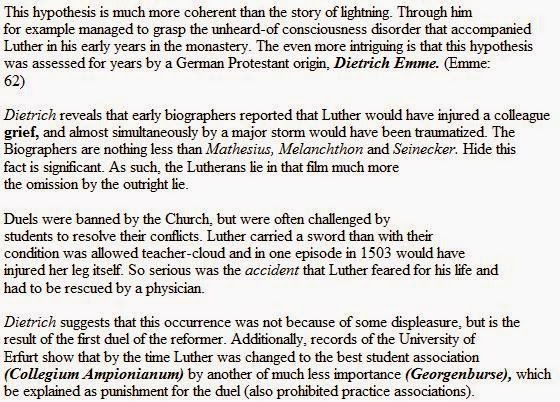 That is, he looks at Luther's health from the historical reports, and then at times diagnoses his suffering and how that impacted his work. I put this post together in about twenty minutes, so when I have more time, I'll be looking further into this based on the clues above. Just to prove I'm not the meanie some think I am, I searched the term "Dietrich Emme" and found a helpful bit of information via this link (Give credit when it's due). This blog posted an edited snippet from the magazine, Thirty Days: "Struck, But Not By Lightning," by Tommaso Ricci, No. 2, 1992, pp. 62-64), worth checking out on this topic. I'm always curious as to the Roman Catholic interpretation of Luther and the Reformation. I do like Mitch Pacwa, but I've heard him say some not so true historical stuff on Luther and the Reformation over the years. Perhaps now that he'll be focusing directly on Luther and the Reformation, his facts will be updated. Sometimes we hear stuff, and just repeat it, not realizing it's wrong. With this particular event (or non-event), I'm hopeful he'll be fair. The conclusions seem to be based on circumstantial evidence, and it's interesting that not too many people have picked up on this, leading me to believe it's not compelling circumstantial evidence. Even Pacwa used the word "apparently". On the other hand, even if this "duel" is true, it doesn't change anything. This entry was revised 4/3/2018 for formatting and dead links. Also, here is the audio clip of Father Pacwa saying Luther killed someone in a duel. I debated as to who to follow in my review of a recent Roman Catholic book on John Calvin. Calvin's order or that put forth by a Roman Catholic author. Common sense tells me to follow the order of argumentation set forth by Calvin, but since this review is on the analysis put forth by a Roman Catholic author, I'm going to journey through his book via his order. Unfortunately, this is like cooking pasta in a big bowl, then trying to organize each strand into a picture of the Mona Lisa. For instance, the very first snippet of analysis put forth by the author is directed toward the thirteenth point of a sixteen point extended argument from Calvin. I'll begin where this Roman Catholic author begins. I'll note the title of his section, and provide the reference to The Institutes. To follow along, simply read the section of Calvin's Institutes noted. I'll be using both the Battles and Beveridge translations. For anyone time challenged, consult Analysis of the Institutes of the Christian Religion of John Calvin (New Jersey: P and R Publishing, 1980). This text outlines Calvin's actual argument in each section. 1. The Catholic Church vs. the Bible? The Catholic Church doesn't create dogmas with utter disregard for Scripture (quite the contrary). Calvin fails to document what he charges. We make no such dichotomy. Calvin does because he thinks in "either/or" terms: for him, if there is true Church authority, this must somehow inexorably be opposed to Scripture in some essential fashion. It's simply not true. Their statement that the church cannot err bears on this point, and this is how they interpret it—inasmuch as the church is governed by the Spirit of God, it can proceed safely without the Word; no matter where it may go, it can think or speak only what is true; accordingly, if it should ordain anything beyond or apart from God’s Word, this must be taken as nothing but a sure oracle of God. Now it is easy to conclude how wrongly our opponents act when they boast of the Holy Spirit solely to commend with his name strange doctrines foreign to God’s Word—while the Spirit wills to be conjoined with God’s Word by an indissoluble bond, and Christ professes this concerning him when he promises the Spirit to his church. Here again they mutter that the church needed to add some things to the writings of the apostles, or that the apostles themselves afterward properly supplied through a living voice what they had not clearly enough taught. For, of course, Christ said to the apostles, “I have many things to say to you which you cannot bear now” [John 16:12]. These, they explain, are decrees which, apart from Scripture, have been accepted only by use and custom. Not only are those things expressly stated in the Scriptures or proved from them to be believed and kept (something the Lutherans are willing to do), but also it is necessary to believe and keep those things Holy Mother Church believes and observes. For not everything has been clearly handed down in the Sacred Scriptures, but very many have been left to the Church to determine (which is illumined and governed by the Holy Spirit, and on this account cannot wander from the path of truth). Hence the Savior said to his disciples [Jn 16:12f ]: "I have yet many things to say to you: but you cannot bear them now. But when he, the Spirit of truth, is come, he will teach you all truth." Therefore the Church observes in its rites and ceremonies many things, from the intimate inspiration of the Holy Spirit, and the tradition of the Apostles, and of the holy fathers, which even if not expressly stated in the Scriptures, yet it is wicked to depart from them or take exception to them. Indeed these things are most confirmed to them, and on that account are to be enforced and observed by all true evangelical and Pauline Christians (such do the Lutherans falsely boast themselves to be). "Therefore, brethren, stand fast; and hold the traditions which you have learned, whether by word, or by our epistle" [2 Thess 2;14]. [Enchiridion of Commonplaces (Michigan: Baker Books, 1979), p.46]. A technical point of historical research concerning Trent sheds some interesting light on the matter. In the original draft of the fourth session of Trent the decree read that “﻿the truths … are contained partly [partim] in Scripture and partly [partim] in the unwritten traditions.﻿” But at a decisive point in the Council’s deliberations two priests, Nacchianti and Bonnucio rose in protest against the partim … partim formula. These men protested on the grounds that this view would destroy the uniqueness and sufficiency of Scripture.﻿﻿ All we know from that point on is that the words partly … partly were removed from the text and replaced by the word and (et). Did this mean that the Council responded to the protest and perhaps left the relationship between Scripture and Tradition purposely ambiguous? Was the change stylistic, meaning that the Council still maintained two distinct sources of revelation? These questions are the focus of the current debate among Roman theologians. [“﻿﻿Sola Scriptura: Crucial to Evangelicalism.﻿﻿” The Foundations of Biblical Authority. James M. Boice, ed. Grand Rapids: Zondervan Publishing House, 1980]. The early canons of Gratian, especially Ecclesiasticarum, In his rebus, and Catholica, are clear that Scripture, apostolic tradition, and local and universal customs (provided that they contravene neither positive law nor the law of reason) have equal force. Apostolic tradition was, of course, a fixed body of instructions, the contents of which were well known from references to it made by the fathers. What local and universal customs embraced was, however, not so evident. Clearly they were less ancient than the apostolic traditions, but how ancient did a custom have to be for it to be traditional? The fact that many of the beliefs and practices the Romanists defended as traditional or customary were of recent date caused them little embarrassment. This must not surprise us, for their appeal was ultimately not to antiquity, nor to catholicity, but to the fact that the doctrine or discipline at issue belonged to that church to which Christ had promised the Spirit of truth. The process of being led into all truth was one that nullified all considerations of antiquity and universality, "for the Spirit blows not only where it will, but also when it will" [Ibid., p.166]. [Calvin's Institutes] was written at a very different time and place. To correctly interpret Calvin, you’d need to know about his intellectual influences, the socioeconomic and political conditions of the day, the historical antecedents to his theological terminology, the identity of his theological opponents, and century. What may be common knowledge for someone living in the 16th Century is hardly common knowledge for someone living in the 21st Century. Catholics do not do this. Scripture often points to traditions outside of itself that are true. Therefore, to hold such a view is not to hold to a "mutilated and incomplete" Bible. It is to hold to all that the Bible itself asserts. The one who denies that there is such a thing as a tradition described and fully accepted in Scripture, is selectively disbelieving part of that same Scripture. It isn’t being accepted in its totality. Calvin is discussing the claim that extra apostolic God-breathed material exists beyond the Bible. He argues in response that when the apostles committed their doctrine to writing, they weren't so incompetent to leave important things out which needed to be given to the church via a "living voice." Quoting Augustine, Calvin says, "When the Lord said nothing, who of us may say,'These things are or those things are’? Or if one dare say so, what proof does he provide”? Here would have been a perfect spot for the author to actually supply a Biblical Catholic answer. Which God breathed Traditions does the Bible say exist outside of its pages? Well, of course the Bible can't tell you what they are, that's why they're Traditions! Who can tell you? Why, the Roman Catholic Church... but can they really? They've yet to declare whether the partim-partim or material view is that described in Trent. Those Calvin faced were clearly of the partim-partim camp. Catholic Partim-Partim Sufficiency claims part of God’s special revelation is contained in the Scripture, and part is contained in Tradition. In this view, the Bible is “materially insufficient.” The New Catholic Encyclopedia states of those who hold this view, “Neither tradition nor Scripture contains the whole apostolic tradition. Scripture is materially (i.e., in content) insufficient, requiring oral tradition as a complement to be true to the whole divine revelation” [Source: New Catholic Encyclopedia (1967) Vol 14, p.228]. The other is the Roman Catholic Material Sufficiency view. It holds the Scriptures are “materially sufficient” meaning the entire content of revelation is in the Scriptures, or that divine revelation is contained entirely in Scripture. That is, all the doctrines Christians are to believe are found in the Bible. Along with affirming totum in Scriptura, Catholics who maintain material sufficiency also hold “Tradition” likewise contains the entire content of revelation: “totum in traditione”. Thus, two vehicles carry God’s special revelation in total: Scripture and Tradition. Both are infallible in the Catholic view. We believe Scripture is materially sufficient, but not formally sufficient without the Church as a Guide. We believe that Scripture and Tradition are "twin fonts of the same divine wellspring," as Vatican II states. Calvin was well within his right to criticize the view of his contemporaries. They indeed held that the Bible was not complete and needed to have things added. A Roman Catholic recently blogged a large amount of material on John Calvin. I held out reading any of it and waited to see what he'd put forth in a published book ( I eventually recently received his self-published book on this Calvin material). Material on a blog can be edited or deleted as if by magic. A published work though sets one's opinion and research concretely. I plan on at least working through some of it to see if Patrick Madrid's claim that this author's work ably refutes Calvinism is correct. It may indeed be the case it accurately presented the argumentation of Calvin's Institutes and contrasted those differences succinctly with his particular flavor of modern day Roman Catholicism. If that turn out to be so, I'd be pleasantly surprised. Given the author's work on Luther, I do have significant doubts that he accurately presented a correct analysis of Calvin. The author has claimed to present "Biblical Catholic answers." As I work through the material, I'll keep a sharp lookout for these Biblical Catholic answers. This is actually the first quizzical statement from the author. Will the author be presenting Biblical answers which are those interpretations of Biblical texts most commonly used by current non scholarly defenders of Rome? Since there are so few (or perhaps any) actual infallibly defined verses for Roman Catholics to utilize, will this treatment be this Roman Catholic author's particular interpretations of the Bible that serve as a response? Or, will those answers be his particular Biblical interpretation along with his particular interpretation of statements from Papal encyclicals, councils and Tradition, etc.? The author dedicates the book "To my Reformed Protestant brothers and sisters in Christ, for whom I have a great deal of respect. May we rejoice in the common ground that we have, and be cordially open and honest with each other, as fellow Christians, when we disagree." Let me be cordially open and honest. More often than not, seriously Reformed five-point Calvinists do not consider Roman Catholics "brothers and sisters in Christ." Recent argumentation put forth by Doug Wilson and his group (as well as some atypical reasoning from Charles Hodge) are exceptions, not the rule. We can be grateful for the author's graciousness towards separated brethren, but the author should not be surprised that Reformed people deny the hand of fellowship in return for this dedication. Those like the author that knowingly and actively promote Rome's false gospel do not stand on common ground with the Reformed on issues most vital to the Christian faith. The author relied on the older Henry Beveridge translation of Calvin's Institutes (1845) "to easily cut and paste everything in it, without a great deal of extra typing being necessary". This is unfortunate, because a far superior translation by Ford Lewis Battles now is the norm for English readers. A cyber-version of this translation can be obtained for a meager $15 (savvy searchers could probably find it for free). Of the Beveridge translation John T. McNeill notes the Beveridge translation is of "uneven quality" and it's "rather less accurate than either of his predecessors, and is chargeable with numerous minor omissions and a few clearly erroneous renderings" (The Library of Christian Classics edition of Calvin's Institutes, volumes 20 of Westminster's series, p. xlvii). McNeill says though that Beveridge did an admirable job on many sections of the text. One wonders why the author, for a mere $15 wouldn't seek out the best translation? The Battles translation is also more than just a modernized rendering. The in-depth historical and bibliographic notes are of great value to anyone engaging the Institutes. If an English reader really wanted to understand the Institutes and all it entails, the Battles edition is the best choice. To go along with this, any layman serious about engaging the Institutes would greatly benefit from the compendium book by Battles, Analysis of the Institutes of the Christian Religion of John Calvin (New Jersey:P and R Publishing, 1980). Battles provides an outline form for each chapter of the Institutes. I point all this tedium out to note that the necessary tools to understand Calvin in context are readily available for any serious study and interaction with the text. The author wrote he chose to use his "Socratic manner" to interact with the Institutes. What this usually means is that a section of text is posted and then commentary from the author follows. The positive aspect of using such an approach is that one can claim to have interacted line by line with a complete text. The negative aspect is that complex argumentation sometimes must be viewed as a whole in order to be best understood and appreciated. If a text is scrutinized line by line without the whole in view, the argument can be missed, caricatured, or mishandled. Also the "Socratic manner" often employed by the author tends to scream out, "I need an editor." Sometimes what could be said in a paragraph of analysis spans multiple paragraphs of tedium and rabbit trails. In this volume, the author appears to argue against Calvin by reorganizing the Institutes into his own system. For instance, Calvin begins Book IV (the focus of the Roman Catholic author's book) addressing The Holy Catholic Church, our mother. The author approaches this subject on page 323 of his critique. The author begins his book with Institutes IV, 8:13 and IV, 17:48 discussing The Catholic Church vs. the Bible. Calvin though discusses the authority of Scripture throughout the Institutes, but in particular in Book I. The author says his focus is on Book IV of the Institutes: Of the Holy Catholic Church. He claims that Calvinism and Roman Catholicism are far closer on soteriology,whereas the real differences between the two systems are on ecclesiology. With this I have an immediate rejection, as would John Calvin most likely. Perhaps the author means only to suggest that current Roman Catholicism is closer in soteriology to Calvin, whereas, Calvin wrote with his contemporary "Papists" in view. In either case, the differences between imputation and infusion are still two different soteriologies staring at each other across an immense chasm never to be bridged. The author says Calvin didn't even realize how close he was to being in harmony with Roman Catholic soteriology. I would say quite the opposite is the case (see Institutes Book III, 13-20). The author compares his credentials to those of Calvin, noting Calvin's "formal education, rhetorical and literary ability" and "remarkable encyclopedic knowledge". The author though is "just a lay Catholic apologist with a degree in sociology, and no formal theological education (but with lots of informal theological education for over thirty years)". I have to wholeheartedly agree with the author that Calvin is far his superior. Calvin with his limited library (and all those issues which plagued his life) is still the greater intellect compared to the author living in the United States with a computer. The author says that since Calvin's been dead a long time and can't counter respond, Calvin's education makes this a fair fight. That is, it's not unfair to write a refutation of someone that's long gone if they have a pedigree of intellectual accomplishment. The "unfairness" as I see it is in this sense: Calvin wrote against the particular Roman church of his day. The author writes from his modern Roman perspective. As long as the author takes this into consideration, a fair response to Calvin is an approachable endeavor. The author says "I'm confident that [Calvin] has been, throughout my replies, very often plainly shown to be in error. I've often noted that one may be the greatest genius of all time, but if the facts and the truth are not on one’s side, even an infant who knows the truth can 'get the better of them' in discussion." I can appreciate the fact that the author argues for the perspicuity of truth without infallible help. It's refreshing to find a defender of Rome so willing to admit that words and information on a printed page can obviously be clear enough to be true or false, and that a person without formal theological training can arrive at truth. This is refreshingly Protestant of the author. The author notes that even before his book was published, certain Reformed nefarious anti-Catholics were already attacking his Calvin project. After searching around a bit, it appears those being refered to actually made their comments on this blog. The author suggests these minions actually fear such a book on Calvin coming out. Contrarily, those in my immediate apologetic circle that doubt the author's abilities to put forth a coherent response to Calvin by no means "fear" his intellectual prowess. Rather, my response to the project is more like someone watching a car wreck about to happen: Someone get the keys before the car pulls away. Even more to the point, it’s obviously anachronistic to say that because 16th Century work was pitched at a popular level, therefore a 21st Century blogger can write a commentary on that work without any specialized background knowledge. Even if it was written for popular consumption in the 16th Century, to a 16th Century audience, that doesn’t mean it’s equally accessible to a modern audience. It was written at a very different time and place. To correctly interpret Calvin, you’d need to know about his intellectual influences, the socioeconomic and political conditions of the day, the historical antecedents to his theological terminology, the identity of his theological opponents, &century. What may be common knowledge for someone living in the 16th Century is hardly common knowledge for someone living in the 21st Century. So Catholics who are incompetent to evaluate Calvin should consult a Catholic epologist who is equally incompetent to evaluate Calvin. Richard Muller might be qualified to write a commentary on the Institutes. Roger Nicole might be qualified to write a commentary on the Institutes. Paul Helm might be qualified to write a commentary on the Institutes. There are probably some Catholic scholars who would be qualified to do so as well. You are not. Your commentary on the Institutes is an exercise in self-conceited charlatanry. I thought it was bad some years back when [the author] claimed he didn't even need to know the alpha from the omega in order to "refute" an argument advanced by a man who had been teaching Greek on the college level for many years. I thought it was bad when a few years back he claimed that an entire critical portion of my thesis on conciliarism, discussing the centuries of Medieval canon law debates about the limits of papal power, was "too boring" for him to read through and try to figure out, but he was going to go ahead and "refute" my "dumb" statements about the orthodoxy of conciliarism anyway. The notion that [the author] is writing a "commentary" on Calvin's Institutes, however, tops it all off. The man simply has no concept of his limitations, and despises the correction of others who do. This is one part of the biblical definition of a fool, and since [the author] apparently considers himself a Modern day Socrates, it is worth noting that Socrates would have called him a fool, too - not to mention a Sophist. The question being raised about qualifications to, say, write a "commentary" on Calvin's Institutes is very interesting and touches precisely on why I am so hard on Internet apologists. It's one thing to blog in a spirit of "faith seeking understanding" inquiry where one recognizes one's intellectual horizons and is seeking to grow in his or her understanding. It's quite something else to set oneself up as a master of some subject matter for the purpose of "defending the Faith" and acting like the command to "give an answer" means that any old time you run into something you don't understand, a few nights with encyclopedias and popular-level works will suffice to write a definitive "refutation" of someone's "errors." It is still an interesting question - the limits that laymen should observe when putting their thoughts out in public. I scrolled through the papal document on lay apostolates last night, and while I would not be able to say that I have a great grasp of its guidelines, I did find it interesting that it said some things about laymen needing to have specific mandates from the hierarchy and obtaining "serious" training for the purpose of being competent to do those mandated tasks. It does make an outsider wonder about much of what goes on in the Catholic apologetics world, especially the common enough phenomenon of Joe Blow, who just converted 6 months ago after reading 25 pages of the Church Fathers, 100 pages of Catholic convert stories, and a 2 page summary of Newman setting himself up as an "apologist." This is how the academic snob views most popular analyses, written for the masses and the proverbial “common man,” rather than merely to academics and pointy-headed “intellectuals.” Neither of these men, however (ironically), are actually academics themselves. One is a teaching assistant and the other is still trying, in his late thirties, to obtain a graduate degree. Both have been very active on the Internet for years (a “popular” medium if there ever was one), since that has been the only way they could be read at all (neither having had a book published by reputable publishers, as I have, six times now). They seem to believe that the only people who can think and analyze and critique are scholars and professors. Yet they write such analyses all the time, and are scarcely more qualified than I am (if not less) to do so. One can see that both Hays and Enloe raised serious questions as to the author's work on Calvin, yet it is enough to attack these men personally as a response, in print. One wonders if any publisher or editor would have kept such comments in a published book. He ignores their constructive criticism and says,"No law or rule can be found that would forbid me from doing this, or entail that this endeavor ought to be defined as having 'no concept' of my 'limitations,' as one of my critics put it, or, 'an exercise in self-conceited charlatanry,' as another delightfully opined." Even if there was a law or rule, one doubts the author would follow it anyway. The author says his book is a "gift to John Calvin". Poor Calvin, all his opponents want to give him refutations of the Institutes. Servetus sent Calvin his Christianismi Restitutio, an attack on the Institutes. Normally, gifts aren't meant to tear a person down. I do find it interesting that a man deemed a heretic by Romanists and Protestants likewise wanted Calvin to have such a present. The author finishes his introduction by stating, "May God the Holy Spirit, our Helper, guide us all into all truth, and grant us the will, by His grace, to want to always seek truth." I haven't done any searches on this sentence, but it is rather curious for a Roman Catholic espousing free will to ask God to "grant us the will." Perhaps a little Calvin actually did rub off on the author. I recently posted The Canon as Infallible Sacred Tradition over on aomin.org. I realize this type of post is... well, argumentation that has been presented before. I wanted to explain the odd circumstances that provoked me to put it together. A prominent central NJ pastor is doing a month-long series on Catholicism. See liquidchurch.com and bighairpreacher.com. You can listen to his messages at liquidchurch.com or on iTunes (search for 'Liquid Church'). How do Catholics respond to what he says? Does he misrepresent Catholic theology? He doesn't put it in a good light, despite that he says he's not out to "trash Catholics". Now normally I wouldn't even bother to visit a site like the one mentioned. I'm sure there are a number of ministers takings shots at Romanism, and probably some using horrendous argumentation. I was recently made aware of this particular church ("Liquid Church"), and it's actually not far from where I live. It's a church geared toward the youth, and I've heard it's quite successful (in terms of popularity and attendance). They've got the great band, and all the media enhancement, and probably are somewhat emergent, though I haven't looked over their site very closely. They do appear to be non-Reformed, lacking creeds, and dispensational in eschatology. I wouldn't expect to find the same quality of argumentation against Romanism as say found as that put forth by a Reformed church. Now here's where it gets personal. I sort of know the minister of this church. He actually grew up in the same church I did. He was at least 4 or 5 years younger than I. I was actually good friends with his older brother back in my teens- we were both guitarists, or rather, guitarist wanna be's. I have very fond memories of the "Freebird" two hour jam sessions in which two 14 year old boys traded riffs, blew up amplifiers, broke strings, and had the police show up telling us to turn our amplifiers down. I think we also had a few good doses of electricity pumped through us by plugging too many amplifiers into one ungrounded outlet. Great times! Now fast forward 27 years. I have no idea where this brother is, but little Timmy is now a very successful local pastor. It was probably out of sentiment that I went and visited the web page that so infuriated the Romanists on Catholic Answers. I ended up getting involved in the blog comments. I'm not sure how skilled Pastor Tim is with basic Romanist epistemological argumentation. I watched a few clips from Pastor Tim on Roman Catholicism, basic stuff, not bad, but definitely not able to meet the epistemological issues raised by Romanism. I don't even know if Pastor Tim reads his blog comments, or even remembers me. But if he does visit his blog, he'll see that I interacted with the old rewarmed canon argument. It's funny, I would've thought this argument would've been retired by now. I know I haven't listened to or played Freebird in many, many years. My response is basically that you're committing a post hoc ergo propter hoc fallacy. Alot of EOC doctrines resemble Mormonism; that doesn't mean they're related. Looking at it the other way, all the ancient heretics held to doctrines that EOC would accept as well - that's what makes heretics so dangerous. They creep in, sound the same in almost everything, but secretly introduce destructive heresies, subtly, drawing away disciples after them. So this point of yours in principle proves too much. Otherwise stated, it proves nothing. DavidW today laid out 5 questions on this topic he'd like me to address. Let's see how well he did. 1) No, it's not a tu quoque. I don't grant that Calvinistic predest is of Gnostic derivation, remember? Rather, I derive Calv predest from Scr, which preceded Gnosticism. So, that's wrong. 2a) "early church writer" means "someone in the early church who wrote". Nothing more or less. The entire reason I use that term is to point out your question-begging distinction between "Church Fathers" and "heretics". You test everythg by the church; well, what if those whom you now identify as heretics had won the struggle? Then the men you now identify as CFs would be heretics, to you. This is the problem with the Sola Ecclesia position; the only way you can judge the heretics of old to have been wrong is b/c the modern church is the group that won out, that won the power struggle. Not so for me - I can and must judge anyone and everyone and their teaching by the Word of God, which does not change. I've given you three many times - Jesus, Peter, Paul. This business about early church writers and the dissent that existed between them is an internal critique of the EO position. It doesn't have any bearing on Sola Scriptura. 3) I've identified your arguments as committing the post hoc ergo propter hoc fallacy (and am still waiting for a rebuttal). I can demonstrate that my doctrines are drawn from Scriptural exegesis. The ball's in your court. If the Gnostic doctrine is not the same as the Calvinist doctrine, surely you should be able to explain how they are different. Gosh, let's see. Oh, I know - one's Trinitarian and Christian, the other isn't. One's drawn from Scriptural exegesis, the other isn't. Nope, saved by the grace of God. Fail #1. Faith, then, is no longer the direct result of free choice, if it is a natural advantage. Define "direct", "result", "free", and "choice". Besides, Calvinism teaches that the regenerate man DOES freely choose - he chooses God b/c his nature has been changed and he's been given a new heart. Before that, he always freely chooses death and sin, b/c his nature is dead in sin and he hates God, his Enemy. Yet Calvinism teaches we are born dead in sin, and w/o God's intervention we will go to Hell forever. It's so funny how you want to equate the Trinitarian God of the Bible with the Gnostic "nature". Why would you do that? And yet the Bible teaches, and Calvinism of course affirms, that "there is no one good, no, not one." Fail #5. For this reason it is that they neither regard works as necessary for themselves, nor do they observe any of the calls of duty, eluding even the necessity of martyrdom on any pretence which may suit their pleasure. 1) Calvinism teaches that God works thru means. Fail #6. 2) Calvinism teaches that man is responsible and called to "be holy as your Father in Heaven is holy". I am obligated to follow the entire law of God. Fail #7. Perhaps you're confusing Calvinism with HyperCalvinism? I'm pretty sure you've been corrected on that before, but you seem not to be a big fan of taking correction. Fail #8. Now that, friends, is a lot of fail. 4) Irenaeus says They have also other modes of honouring these images... Seems like he's not a big fan of ANY honoring of images. I can certainly see where he's coming from - why not honor Christ? If you say "we already do", are you denying you could do so more? Or have you honored Him enough already? Let someone else get their snout in the trough, as it were. In looking over Mitch Pacwa's upcoming Reformation video series, I came across this page from Ignatius Productions. It's a set of audio clips from Pacwa on the Reformation. Here's a short mp3 clip from Pacwa on Luther removing books from the Bible. 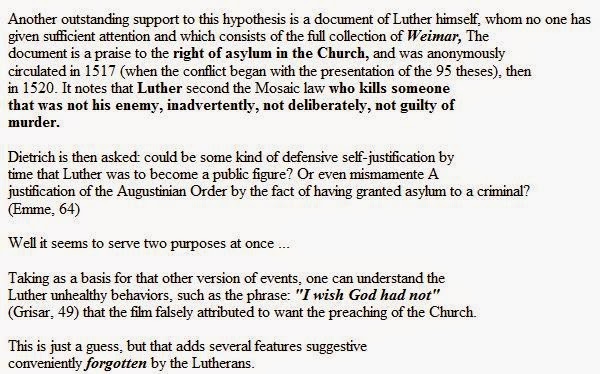 This snippet is part of a ten minute clip by Pacwa specifically on Luther (the clip is no longer available). 1. For two years, Luther tried to "kick out" the book of Revelation from the New Testament. 3. Luther removed these books because they contradicted the doctrine of justification by faith alone. It is a simple historical fact that Luther’s translation of the Bible contained all of its books. Luther began translating the New Testament in 1521, and released a finished version in 1522. Luther therefore never tried to "kick out" books from the Bible. I'm not sure why Pacwa mentioned an alleged "two year" struggle with the book of Revelation. I'm not aware of any historical discussion in the year 1524 from Luther (or the years in between) pertinent to taking Revelation out of the his translation. Pacwa appears to be confused by Luther's prefaces, which I've covered here. It's often the case that Roman Catholics equate Luther's questioning of the canonictiy of certain books with taking books out of his published bible. For instance, Jimmy Akin used to say Luther "cut books out of the Bible." This is a typical error made by Roman Catholics. As to the list of books Pacwa asserts Luther tried to kick out, I know of no evidence that Luther ever had any negative criticism inclining him to "kick out" 2 Peter, 2 John, and 3 John. I checked Luther's original prefaces from 1522, and there's not even a hint of questioning these three books. In facts, of 2 & 3 John Luther stated, "The other two Epistles are not epistles of doctrine, but examples of love and faith, and have, besides, a true apostolic spirit" [Works of Martin Luther vol. 6 (Philadelphia Edition), p.476]. On the other hand, the person that did question the authenticity of these three books was Cardinal Cajetan, one of the leading Roman Catholic scholars of Luther's day. Will this fact make it into Pacwa's Reformation video series? I doubt it. As to Luther removing books because they contradict justification by faith alone, the only book I'm aware of that would come close to Pacwa's description is the book of James. Luther's questioning of Jude primarily has to do with its status in Church history, and it’s internal evidence as to its apostolicity. As to Revelation and Hebrews, his reasoning was similar. Luther never explicitly adds Revelation to his list of “chief books.” However, his tone of writing in the 1530-revised preface contains only a remnant of the doubt as to its canonicity.With Hebrews, Luther’s opinion fluctuated throughout his career. Luther tried kick three books out of the Bible he thought were biblical. Luther rejected James, Hebrews, Revelation, 2 Peter, 2 John, and 3 John because they contradict justification by faith alone. The truth is, Luther's opinion of James is the closest that comes to Pacwa's description. My friend, Mark, in the combox of my previous article on "Khoda or Allah??" (Another Mistake by Ergun Caner) asked about "The Camel Method" of Evangelizing Muslims, which is referenced in a NY times article about it and Ergun Caner. UPDATE: Please see the updated information in the comboxes on the Camel Method. Because of this new information to me; especially the letter from Phil Parshall, and my need to read the Camel Method again; I will refrain at this time from speaking about the Camel Method and take the references to it out; but I will leave my analysis and critique of the C-5/Insiders Movement/"Common Ground" methods. I confess I was speaking out of my years of conflict/tension and confrontation with fellow missionary types on the C-5 level and the emotional tension that that caused. I apologize for including the Camel Method in with the clearly wrong C-5 level methods. But I do need to study that book again. I want to thank Erwin for coming here and commenting. The problem with these methods are that if they are actually opening up the Qur’an and studying it as if you are treating it as a Muslim would, as, “this is what God says”; it is treating it like an authoritative, “God-breathed” book – this is deceptive because the Muslim thinks you are affirming everything in it as inspired. I have had former Muslims tell me this when I quoted a verse from the Qur'an to make a point. In their contexts, you would have to respect the Qur’an, wash your hands, and put it on a stand with Muslims in order to actually “get into it” deeply with serious Muslims. If you don't say anything about the parts of it that are wrong, we can give the wrong impression to our Muslim friend. Basically, there are some things in the Qur'an that are true, because they actually came from the Christians and the Bible. The things that are true in the Qur’an came from previous revelation. The problem is that Muhammad took information from the Bible and changed some of the details and most of the meaning and significance of most of the stories that the Qur’an uses from the Bible. The Bible had not been translated into Arabic yet; and the early church had left their first love (Revelation 2:4-5) and allowed the Mary cult of statues and icons and praying to her as mediator; and the church at the time of Muhammad had fallen into a works/rituals/externalist/sacerdotal controlled religion to overshadow salvation by grace alone and justification by faith alone. Muhammad and the Arabs could not see Christ, because of all the false doctrines and practices that existed at the time. Furthermore, the “Christians” closest to Arabia were mixtures of heretics and Gnostics and nominal Christians. The biggest problem with contextualization methods like the C-5 / Insiders / Common Ground teaching is that it appears/gives the impression that it is treating the Qur'an as an inspired book. Without biblical discipleship teaching, these large numbers that people are claiming is happening in some parts of the Muslim world through these methods, will naturally create lots of syncretism and heresies. And it already has. They don't seem to be willing to teach on the Trinity or the hypostatic union/2 natures of Christ. It also angers the Muslim authorities when they find out what is going on. They know it is heresy and syncretism of mixing the two religions into something that is neither one. It gives the Muslims that impression, when you open it up and look to it for study; and if one takes too long to actually get to the Injeel (NT); then many Muslims have later said, “You did not tell us that at the beginning; you deceived us!” This has created even more anger. Dr. White’s saying is true: “Whatever you win them with, that is what you win them to.” And his saying, "Theology matters" is true also. The “Insider’s Movement” (C-5 level contextualization) is definitely deceptive; and suggests Muhammad may have had the NT gift of prophesy (! Can you believe this? ); and it suggests and implies that the Qur’an is an inspired book. They also encourage Muslims who come to Christ to keep doing all the Islamic rituals and keep on going to the Mosque. This does not teach them salvation by Grace alone, justification by faith alone, nor the biblical doctrines of what church (ekklesia) is. They will quickly fall into the Galatian heresy of legalism and mixing works and rituals in order to “earn points with Allah”. These methods do not teach a clear repentance from the false system of works and to the Tri-une God of the Bible. Jesus said, “unless you believe that “I am”, you will die in your sins.” (John 8:24) They reinterpret everything that does not agree with the NT. These kinds of methods can be deceptive, because the missionary of this method seems to be actually opening the Qur’an on certain verses, and is not saying he disagrees with the rest of the Qur’an; he is trying to focus only on some good "bridges" in the Qur’an. They don't seem to call for repentance from the false religious system of Islam and its "faith +works" righteousness. Generally, I agree with the principle of focusing on Jesus Christ and His character and His word in the NT and avoiding direct attacks against Muhammad. Muslims are eastern people; they will understand when you focus on Jesus and that He and His rasoolan (apostles) were the final revelation. (John 17:8; John 16:12-13; Jude 3, Hebrews 1:1-3; Ephesians 2:20; Revelation 22:18 (by principle). When Muslims read that Jesus rode into Jerusalem on a donkey and was meek and gentle and endowed with Salvation; (Matthew 21:1-10); they immediately get the contrast with Muhammad, who rode in a horse and sword to conquer. They understand this without you having to directly point it out. I have seen this many times over the years. Having said that, I do think that the questions that David Garrison asks in the NY times article are good questions to ask Muslims. Let’s be balanced and wise and think. I don’t see a problem with asking Muslims these questions and then getting into the Injeel (the NT), especially Luke and Matthew with them. I do think that these below are good and truthful concepts that are in the Qur’an that we can use as starting points in conversation with Muslims and getting into the Gospels with Muslims: I am not affirming the Qur’an as an inspired book; but I am saying that some of the information that Muhammad got from the Christians was true. The problem is, it got distorted and corrupted and then Muhammad re-interpreted most everything he got from the Jews and Christians. Isa (Jesus) was born of the virgin Mary. (Surah 3:45-48; 19:19-21) This is why the Jesus film was done from the Gospel according to Luke, and why it is good to start with Luke or Matthew with Muslims. They need to read the Gospels first to get the whole birth, life, death, and resurrection of Jesus. The Holy Spirit uses His word. John 3:8; I Peter 1:23-25. Jesus is called “the Kalimat’allah” (Qur’an 4:171; “The word of God”. Kalimeh کلمه is equivalent to “logos” in John 1:1; 1:14 and I John 1:1; Revelation 19:13.) Muhammad got this information from heretical, and nominal Christians and Gnostic gospels that were mixed in with a growing cult of Mary encircling Arabia (N. Arabia, Jordan, Yemen) and Palestine/Lebanon/Syria. Islam denies that “Kalimat’allah” means the Deity of Christ in the way that John 1:1, 14 teaches, but it can be a useful phrase to use in discussing Jesus with Muslims. Jesus is called “a Spirit from God” - Qur’an Surah 4:171; The concept that Jesus is a “spirit from Allah” is an important one to use to show that His divine nature is His Spirit and soul inside of Him; and He, as "spirit" (God is Spirit, John 4:24) was incarnated – He became flesh and entered into time and creation. I use Luke 1:34-35 and Hebrews 10:5 with Muslims, “A body, you have prepared for Me”, Jesus said. The Qur’an encourages the Christians “to judge by that which Allah has revealed therein”, in the Injeel. (The Gospel) ( Surah 5:47). Dr. White uses this verse in his debates with Muslims, and missionaries have been using this verse in the same way for decades, even centuries, in order to show that the Bible at the time of Muhammad was not corrupted. So, it is not wrong to use some verses from the Qur’an, depending on what it is and how it is used. One of the most powerful verses in the Qur’an to know when dealing with Muslims; “If you are in doubt about what we are revealing to you, go and ask the people of the book.” (Surah 10:94) This, along with 5:47 and other verses, show that the Bible has not been corrupted. There is some kind of idea in the text of the Qur’an of a substitutionary sacrifice for sin, even though Islamic interpretation denies this. – “We have ransomed you with a mighty sacrifice.” Qur’an 37:107 See my previous article. Not everyone can be a formal debater with Muslims like Dr. James White. His work in NT studies and theology is excellent. His book, The King James Only Controversy and NT textual materials are excellent, and are honest with the few textual variants that do exist; and this demonstrates that 99 % of the text we have today is the same as what was revealed originally to the prophets and apostles. No textual variant affects any major doctrine. We can be honest with our Bible manuscripts and how they came down to us in history. His material on affirming the text of the NT is crucial and some of the best, in dealing with Muslim apologists and scholars who use liberals and skeptics to attack the Bible; people like Bart Ehrman, John Dominic Crossan, Robert Price (debate coming up; see www.aomin.org), and atheists like Christopher Hitchens and Richard Dawkins, and popular liberals like John Shelby Spong and Barry Lynn; and the popular level NPR shows, Bill Maher, and the Comedy Central Shows such as “The Daily Show”, and “The Colbert Report” types of attacks against the Bible. Everyone will not be a skilled apologetics debater like Dr. White, but all Christians are to witness, and can be equipped and reach out to Muslims with respect and friendship and hospitality. Doctrinal folks like me need to be balanced. I like to call my approach, “The Balance of Apologetics and Agape”. (Jude, verse 3 along with verses 20- 23; I Peter 3:15) We must do both; be equipped in all the apologetic issues that come up with Muslims, but love and respect them as people and learn some of their culture in order to not bring unnecessary stumbling blocks in addition to the necessary stumbling block of the cross and the gospel. Be willing to meet Muslims and accept their hospitality when they invite you to their home; and have a strong cup of Turkish coffee with them; or Iranian tea; or Shish Kebab and Hummus and Pita bread with an Arab. Love them as people created in the image of God. Be the friend of sinners and tax collectors as Jesus did. (Matthew 9:9-13; Luke 5:27-32; Luke 15)If you start with hospitality (eating a meal in their home, and inviting them to your home), love and respect, you can most always create a context where you can open up the New Testament Scriptures with them. The best chapter of Ergun and Emir Caner’s book, Unveiling Islam, is chapter 16, where they discuss reaching out to Muslims with hospitality and love and respect and cultural issues; and using some key verses from the Qur’an to know. I also agree with Dr. Caner's point in the NY Times article that George Harrison meant “Hare Krishna” by “My Sweet Lord”, as he clearly praises and calls upon “Hare Krishna” at the end of his song. George Harrison was a Hindu. Hinduism is a false religion; paganism; polytheism. Anyone who knows George Harrison and the Beatles history, understands this. But, I disagree with Dr. Caner when he says we cannot use the word “Allah” for the God of the Bible, for Arabs and Arabic speakers as my previous article shows. See Again, here. Doctrinally, Allah of Islam is not the God of the Bible, but linguistically, it is the best word in Arabic to communicate “the one true creator, Sovereign God” and equivalent to Elohim in the OT and Theos in the NT for Arabic speakers. I haven't read a ton of patristic writing, I freely admit. About 200+ pages starting from page 1 of the Ante-Nicene Fathers, and taking notes the whole way, so far. But I can apply logical argumentation to common Eastern Orthodox argumentation in regard to the way they view patristic support for their position, and thus perform an internal critique of Eastern Orthodoxy. Now, given that the Scriptures are the way they indeed are, it makes very little difference to me whether the entirety of those who identify themselves as "The Church®" over the course of history stand in opposition to what the Scripture teaches - "Let God be true and every man a liar." But of course, anyone who's familiar with patristic writings to a more than surface-level extent will know that the early church situation is not nearly that simple. The questions of who was in schism from whom, who agreed with whom, who contradicted whom, who contradicted himself, who properly represented the actual position of most of the people in the church at his time, etc, are fundamental questions, and far too often our EO and RC friends simply assume that they are unimportant, assume that their church is The One True Church® and thus the default position, and any dissenter from such necessarily has all the burden of proof to defend his dissent. DavidW has responded, I replied, and DavidW once more. I encourage you to read what he said, and here I relate my own rebuttal. approach Orthodoxy on its own terms, free of such confutation. Do you venerate images? Bow down to them? What substantial differences can you name between EO practice and RC practice, besides that they use statues and you don't? The existence of which is evidence in support of my position. I don't think the early church writers had a consistent consensual position, remember? I judge ALL THINGS by Scripture. it's a case of looking at the Fathers on their own terms and in their fulness, as you are unwilling to do. Hahaha, that makes me laugh, that you who ignore early church writers who dissent want to "look at the Fathers on their own terms". Whatever, man. 3. How do they know Epiphanius' letter is a forgery? The very existence of ppl who'd like to forge such a letter shows that there did exist such an iconoclastic strain of tradition. Which, again, is my position. The iconoclasts of the 8th century picked up their iconoclasm from the Muslims. Even Muslims get stuff right, you know. I sorta picked mine up from the OT Jews. You ASSERT that Tertullian doesn't represent early opinion. Prove it. OK, I listened to it, thank you. Macdonald: "He's not technically a Church Father" - begging the very question at hand. Who decided that? Why isn't whoever decided that himself in schism, himself unreliable with respect to what is authoritative and normative in church history? "He wrote a lot" - yup. And yet you judge him wrong on many counts. How is that any diff than what I do with what you claim about CFs that you DO agree with? Why do you get to disagree with an early church writer and I don't? "He did not remain in the Orthodox Church" - so he schismed? So he was Protestant before there were Protestants? "Gnostics wanted Christians to live under extra rules" - that's very interesting. You mean like necessitating works like baptism on top of faith for salvation from sin? "most of the CFs tried to work thru Greek philosophy, that meant to Tatian's crew that they were apostatising" - doesn't sound like there's a ton of unity and agreement in the early church, now was there? There sure seems to be a big diff in the way you EOx talk to Protestants and the way you talk to each other. Kinda like how Yasser Arafat would say "Peace, peace" in English to the Western goober politicians, then go say "War, war" in Arabic to his own ppl (though obviously less violently). "Tertullian is not reflecting the reality of early Christianity, he's reflecting a particular position" - What a dumb thing to say! Of COURSE he was reflecting a particular position. EVERY writer "reflects a particular position". Sheesh. "The church has a tradition that the married women did this, and the girls, I guess, they didn't wear veils. So he makes the statement: 'Whatever favors the opposition to truth is heresy, even if it's ancient custom'. And he says that in a number of places where he's contrasting the tradition of the church, he rejects the tradition of the church, in favor of the prophecies of the women. And it stuck in my mind b/c Cyprian, who comes after him in Carthage, makes almost the same statements; for Cyprian, to him he's not a Montanist, but he always refers, Tertullian for him is the only church father b/c he wrote in Latin, and he refers to Tertullian as 'a master', but he makes that statement in regard to the rebaptism, b/c the church was not rebaptising people from heretical groups but was receiving them by chrismation and Cyprian says 'well, ancient custom is just ancient error', you know, so it's this ultimately, the church disagreed with Cyprian on that and have the canons and everything, but this attitude of rejection of the church tradition. And we will say that OK, not everything that every early Christian ever did is necessarily Gospel, but the consensus of the church and the tradition of the church's practice is part of what Irenaeus is referring to, when he says 'What's to separate us from the Gnostics, who make up their errors? Each Gnostic is just making stuff up. That our teachings go back and are continuous back to Christ' and that's what distinguishes the church from a heretical group. For Tertullian and later Cyprian, they both say 'no, that the church's practice is no indication of what is true,' particularly Tertullian. And of course, he's coming at it from the idea that these Montanist teachers were in fact revelations of the Holy Spirit." There is a lot to catch there, but notice how Macdonald says Saint Cyprian treated Tertullian, a guy who was headed to heresy according to the EOC. Notice how Macdonald even characterises Cyprian's view that Tertullian was the only church father. Notice how these two early witnesses seem to be treating "church tradition" just like I do - easily prone to error, and in the case of the doctrine under dispute, just a mistaken tradition that got accepted by enough people, handed down enough, and eventually crystallised into unshakable "Sacred Tradition". And yet these two men disparage it as merely "ancient error". So what is the EO antidote to this problem? More appeals to more so-called Sacred Tradition? As if that's not the very problem at hand? Why not appeal to what God has said? Oh no, they've got more important things! Like preserving their Sola Ecclesia presuppositions, their pet authority. Questioner - "It's not like he did a flipflop." "That's not surprising. Alot of his writings, when he's writing against the church he's also contradicting his own early writings, when he was in the church...Tertullian sort of took exception with the decision of the Roman church and ultimately decided, even in his pre-Montanist writings, you start seeing, not the earliest ones, but the period about 204 on, he starts adopting Montanist ideas and then 207 he leaves..."
And I have said in the past that a strong case can be made that church fathers contradict themselves in their own writings over the course of time. Of course, I catch flak for that kind of statement from RCs and EOdox, but I bet Macdonald won't catch any. Oh no, b/c he's one of the boys. And then you assume that's what the early church believed. So you DON'T have any polling data, yet you take ~50 writers who wrote variegated things on a wide variety of topics with some disagreement between them and frequent disagreement between writings from any one of them over the course of his life, and from THAT you decide what the early church believed? No, you decide after the fact. That's always been my point. You, the modern EOC, decide which views out of the sparse info that you have from the past you're going to follow. Sola Ecclesia. Pardon me, but I don't want to follow such circular self-referential reasoning, such begging of the very question at hand. I follow what God has most surely said - the Scripture. You're exactly right - that doesn't mean it's not true. ANYthing could conceivably be true; that's the problem of induction at work (since you mentioned logic). You have faith on the modern EOC's interp of archaeology and historical data, despite when we show you that your view of history is flawed. You are a humanist at the core. I have faith in God's Holy Word. Right -- he was a heretic. He did become a Montanist, you know? Yes, I know that, and you're begging the question to claim that joining a Montanist sect means that he was necessarily wrong or out of step with the church. Prove that most ppl weren't in fact part of the Montanists. Polling data. Irenaeus is not talking about my position because my position is the same as Irenaeus' and I sincerely doubt that Irenaeus is calling his own position Gnostic. Wow. That was a naked assertion of epic proportion. How about you actually deal with what he said?